September 28, 2015: A newly released animation created by Roger S. Guernsey, a Williamsburg architect and Friends of Green Spring board member, illustrates the great size of the manor house of the Ludwells’ Green Spring Plantation, and shows its evolution from its beginnings as Governor William Berkeley’s residence in the early 1640s to its renovation by Philip Ludwell III c. 1740, soon after he returned from London after being received into the Orthodox Church in his early 20s. April 23, 2015: Members of the Associates visited the site of Green Spring Plantation in late April, touring the site under the guidance of Carol Tyrer (president of the Williamsburg archaeology firm Cultural Resource Management, LLC and co-president of the Friends of Green Spring) and a local National Park Service official. Appointed by King Charles I as Governor of the Virginia colony in 1641, William Berkeley was granted 984 acres of land designated “by name of Green Spring” in June 1643. The Greate Road, one of America’s oldest roads running from Jamestowne to the Falls of the James River, ran past the green spring, in use by the Paspahegh Indians prior to colonization. By 1650, he had built a massive house and facilities for entertaining that befitted his status as the King’s voice in the colony. In 1680, Governor Berkeley’s widow Lady Frances married Philip Ludwell, grandfather of Philip Ludwell III, thus bringing the property into the ownership of the Ludwell family. The impressive Governor’s Palace in Colonial Williamsburg was built in the early 1700s, partly in reaction to the Ludwell’s grand Green Spring estate which no longer served as the royal governor’s residence. 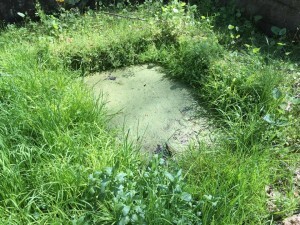 As any visitor can still see today, the original green spring still feeds clear water to this day. An early 20th-century structure currently surrounds the spring. December 19, 2014: Excerpts from a reception held on 4th November, 2014 celebrating the publication of the book Embassy, Emigrants, and Englishmen: The Three Hundred Year History of a Russian Orthodox Church in London. The event was held at the site of the old Russian Imperial Embassy Chapel (32 Welbeck Street, London). 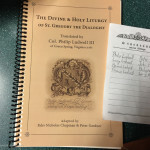 For more information about the book please visit http://www.holytrinitypublications.com. The video includes: short remarks by Archbishop Mark of of Berlin, Germany, and Great Britain and Metropolitan Kallistos of Diokleia; an interview with Nicholas Chapman, director of Holy Trinity Publications, and Nicolas Mabin, long-time parishioner of London’s Holy Dormition parish; and a presentation of the life of Archpriest George Cheremeteff, who served the Russian Church in London from 1952 to 1971. December 14, 2014: Presentation by Nicholas Chapman, director of the Holy Trinity Monastery Press in Jordanville, New York, on the unlikely history of a centuries-old Russian church located at the heart of one of the world’s greatest cities – London. 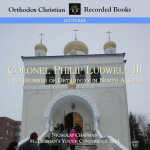 March 10, 2013: “The righteous shall be in everlasting remembrance – further reflections on Colonel Philip Ludwell III” – the theme of a presentation given by Nicholas Chapman at St John the Baptist Russian Orthodox Cathedral, Washington, DC.